The baraat is a wedding procession that is taken out from the groom’s side on his wedding day. Although it does not have any religious significance, it is tradition and a custom that is observed in North India and in Pakistan. This custom basically revolves on the traveling of the groom from his home to the venue of the wedding on a mare with his family and friends celebrating along the way, often with song and dance. 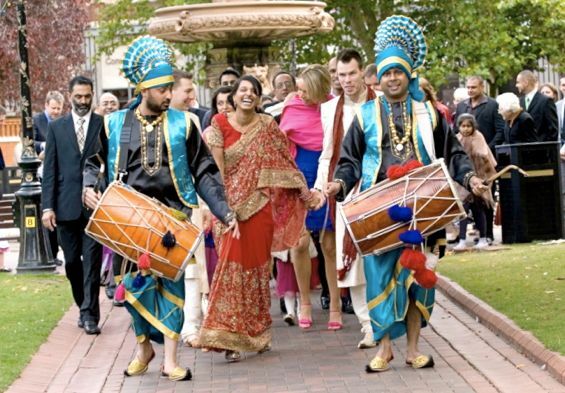 The music is lent by either a brass band or a few dhol wale or percussionists while the family and friends of the groom rejoice in the happiness of the groom. In India, the baraat is one of the most important customs for two communities i.e. Punjabi and Rajputana. Although there are many other North Indian communities that participate in the baraat culture with equal fervor, the importance given to the baraat is a lot higher here. In some cultures, the baraat begins with the custom of tying the groom’s sehra i.e. special veil for the face made of flowers, beads or any other material other than cloth, which is tied to the groom’s turban. The next custom is the sawaari or the climbing of the groom on to the mare’s back in preparation for the journey to the venue. In certain cultures, the groom may make the journey on an elephant’s back as well. The baraat is a grand affair and can be a lengthy procession. If the venue of the wedding is too far away from the groom’s home, the baraat begins in front of the groom’s house and carries on for about an hour and then is paused temporarily. The procession is resumed again at the entryway of the venue and can carry on for another hour. 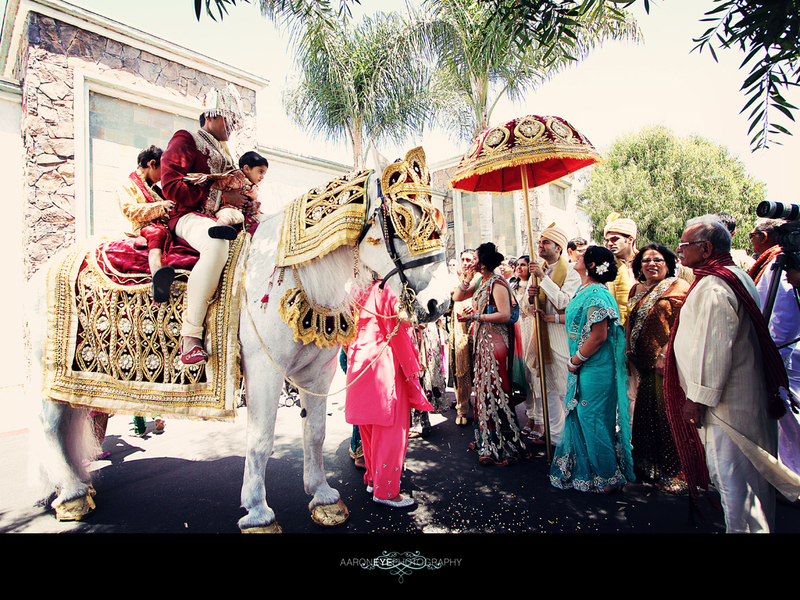 The baraat is the first among the many rituals and ceremonies on the day of the wedding. As the whole celebration revolves around a joyous occasion, the groom is heavily decked, the baraatis or celebrants are lavishly dressed and even the groom’s ride is richly decorated. 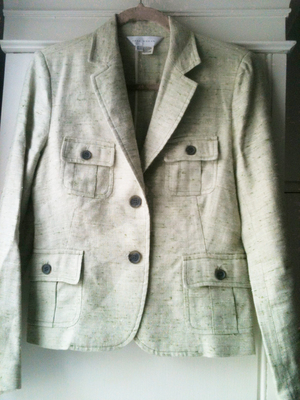 There are certain accessories that are specific to the groom and the baraatis besides the luxurious dressing. A Punjabi baraat is celebrated by both men and women from the groom’s side with a lot of pomp and show. The celebrants dance in front of the groom’s home and in the streets for the duration of the baraat and lead the procession. The musicians lead this procession, followed by the baraatis, while the groom brings up the rear. It is a loud, enjoyable and flamboyant affair. The first ritual to take place at the baraat is the tying of the sehra and is called sehra bandhi. 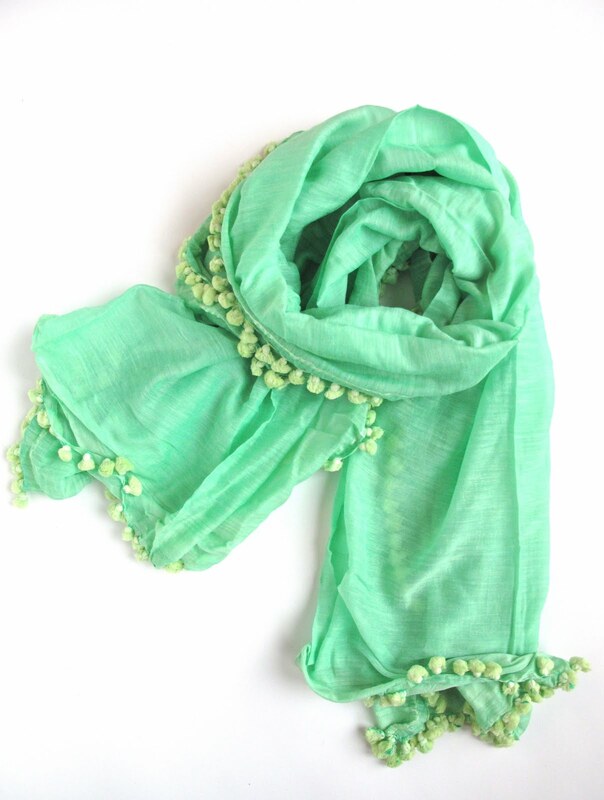 The sehra is a veil made of multiple strings of flowers or alternatively from pearls and other precious gems or gold. During the baraat as well as the wedding, close male relatives of the bride and groom wear turbans in a light, pink colored, cotton cloth. This turban is a symbol of honor and is known as the pagdi. The groom is dressed in an opulent sherwani that is usually in either a golden color or white interspersed with red made of a silk brocade fabric. 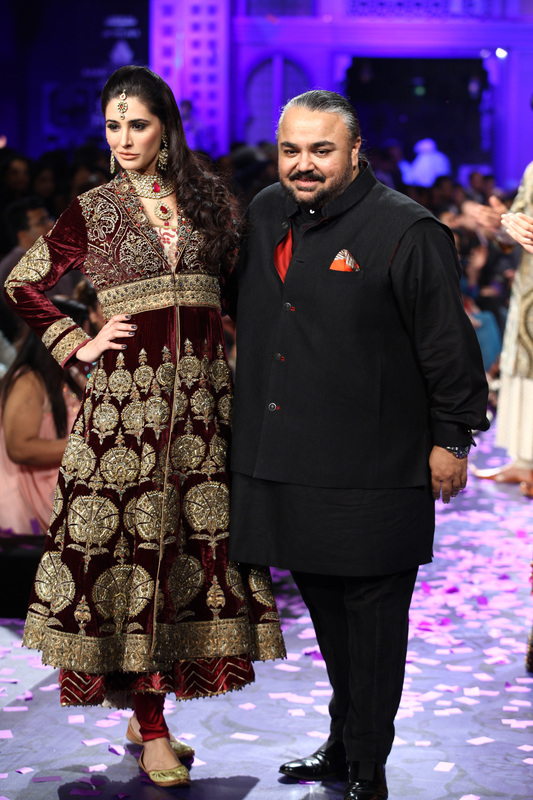 Sherwanis in red, green and purple can also be worn, as long as they are embellished luxuriously. 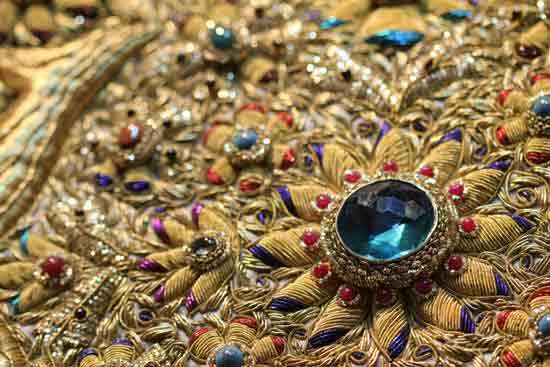 The embellishments on the sherwani are in gold zari and often the cuffs and the collar are inlaid with precious stones. Consisting entirely of male relatives of the groom, the Rajput baraat is a regal and stately affair. 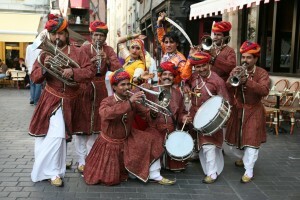 There is no dancing in the streets although the journey of the groom is heralded by musicians. The baraatis wear sherwanis or achkans (an elaborate jacket that resembles the sherwani jacket) with their version of the baraat turban known as the saafa. The saafas are colorful and all participating members carry sheathed swords on their person. The groom wears a gold achkan with churidar pants and jootis. In the Rajput culture, the groom’s turban is orange colored and does not have a veil of flowers, pearls or golden beads. The groom also carries a sword and may ride either a mare or an elephant to the venue. The baraat is no longer a ceremony celebrated by only a few communities in the North. Most of North India has their own version of the baraat and most of these versions resemble the Punjabi kind. The reason for this tendency is that Indian television has featured many movies and programs where the protagonist is either a Punjabi or marrying one. For this reason, the traditions that are shown on the occasion of marriage reflect their culture. Moreover, the idea of the baraat as being another occasion for dancing and merrymaking is very appealing to Indians, who by nature are very boisterous. The baraat is welcomed at the venue by shehnais which is considered auspicious by Hindus, Sikhs and Muslims. 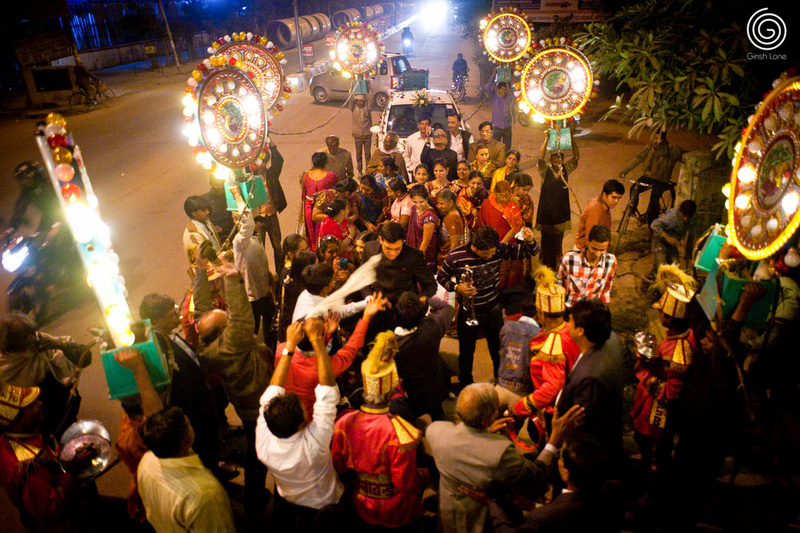 The baraat is followed by a ritual known as milni, where the groom’s family and the bride’s family meet at the wedding. 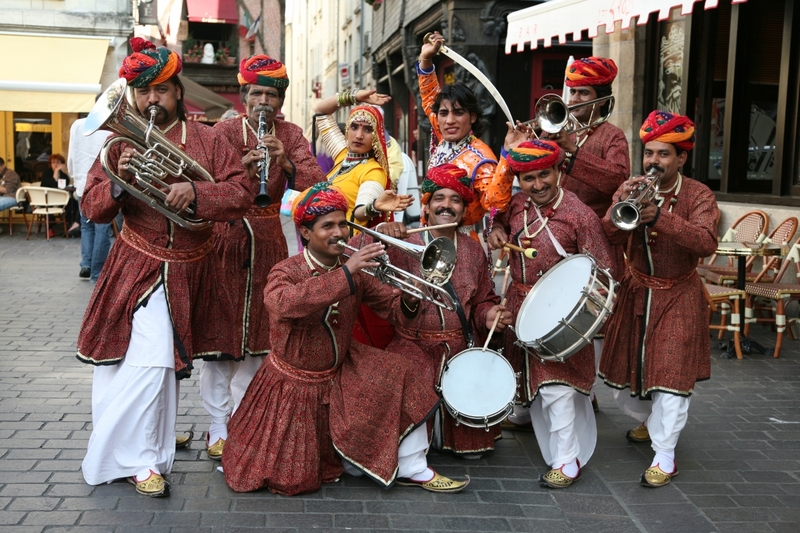 While a brass band is a signature of Rajput baraats, Punjabi baraats prefer the dhol. Whether Punjabi or Rajput, in both baraats the groom’s ride is covered in finery. Hindu Indians across the world organize baraats, albeit on a smaller scale.